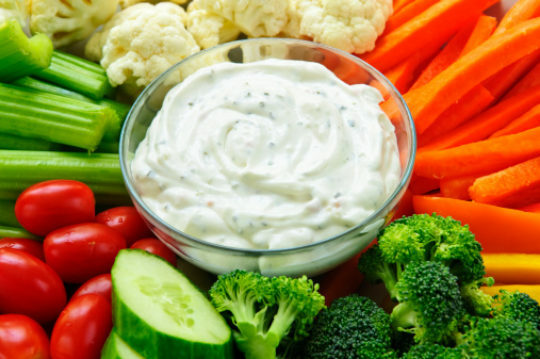 Nothing tastes better than a creamy dip with fresh vegetables and herbs served with toasted pita bread. Nonfat and low-fat cream cheese are mixed together to cut down on the saturated fat, but not on the delicious taste. Tofu is added for smoothness, which gives it a rich taste as well as extra protein – a win-win recipe! Place the cream cheese, tofu, garlic, and pepper in a food processor and pulse until combined. Add the chives, cucumber, bell pepper and carrot, and pulse for a few seconds until just combined. This recipe makes 1/4 cup, which is about 10 servings. Dietitian's Note: A mixture of nonfat and low-fat cream cheese cuts the saturated fat but doesn't cut back on taste.